Studiomaster is showing a number of its products for the first time in Europe at Prolight + Sound next week, including the digiLiVE 16RS (main image) and self-powered digiLiVE 16P-600 digital mixers. 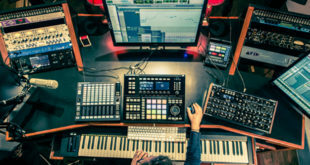 The two new units use the same simultaneous integrated touchscreen and iPad operation as the original digiLiVE 16 compact mixer, which has shipped over 2000 units since its introduction in mid 2016, all in a rack-mount, ‘black-box’ form-factor. Also being shown for the first time in Europe is an upgrade to the LIVESYS5 micro PA/powered monitor system, which adds SD/USB record and playout, and Bluetooth playout, while two new class-D power amplifier series – the HX and QX – offer 2- and 4-channel models with power ratings in excess of 2 x 500 W and 2 x 9500 W, respectively. The digiLiVE 16RS and self-powered digiLiVE 16P-600 are ideally suited for a range of applications including AV installations, small performance venues, music bars and houses of worship; or as a dedicated monitor mixing solution when used with the iPad App. 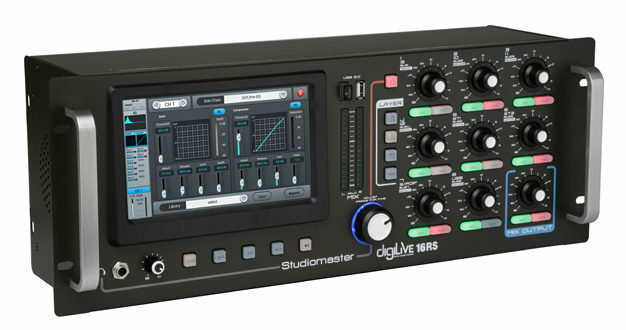 The mixers share the same 16 input, 16 bus, 8 FX bus format of the digiLivE 16. The 16RS features 2 XLR L/R master outs and 6 configurable ‘smart’ outputs, and the 16P-600, 4 ‘smart’ XLR outputs and 4 x 150 W RMS (4 ohms) class-D power amplifiers. The 16 inputs are configured as 12 mic/line and 2 stereo on both models, and both also sport digital S/PDIF I/O and AES-EBU output, as well as a USB interface, 40-bit floating point SHARC processing, and 192 kHz/24 bit AD/DA. 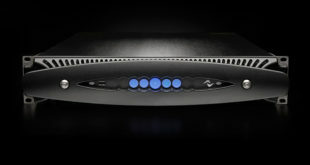 Meanwhile, the ultra lightweight and compact 1U HX power amp series (pictured, above) – designed for commercial installation, conferencing, small and medium scale sound reinforcement and rental applications – includes high efficiency power factor correction (PFC), Thermal, Overload and DC protection, protection and Status indicators, output limiter, multiple gain modes, and more. 2- and 4-channel models with stereo/parallel/bridge mode operation provide reliable and efficient operation at 2 ohm loads. The eight models in the range include four 2-channel models, rated at 300W, 500W, 700W and 900W (at 8 ohms), and four 4-channel models rated at 600W, 1000W, 1400W and 1800W (at 8 ohms). 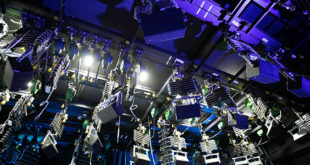 The QX series (pictured, above) on the other hand is intended for large to very large-scale, high-end sound reinforcement, installation and rental applications. Featuring stable performance under high current, low impedance (2 ohms) conditions, the QX series comprises three 2-channel models rated at 3000W, 4000W and 6000W and two 4-channel models rated at 6000W and 8000W (all at 8 ohms).